Ever made a card where everything that could go wrong, does go wrong? Yes, I thought so! This was one of those cards for me. I wanted to play along with the colour challenge over at CAS-ual Fridays, where the theme is tan, white & a bright colour. 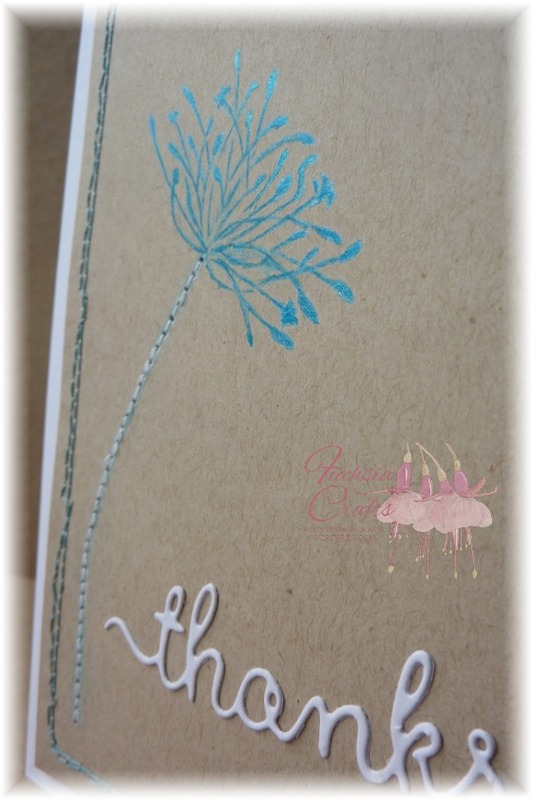 The allium stamp is by Inkylicious & is a two-step stamp but I only used the outline part, inking it up with Hero Arts Unicorn white ink then painting the flower head with Cosmic Shimmer watercolour paint in Aqua Mist. So far, so good. I had decided I wanted to play along with the Sew Cute challenge over at Kitty Bee designs but almost broke my newly-repaired sewing machine trying to sew a border round the main image. I had to hand-sew a second border to cover up the mess of the first! Then I thought the white stem didn’t stand out enough, so I tried painting some of the Aqua Mist over the top but the result was so bad I hand-stitched the stem to cover up the mess. I kept the rest of it simple (didn’t want to tempt fate!) by die-cutting the Thanks word using a die by Clearly Besotted. 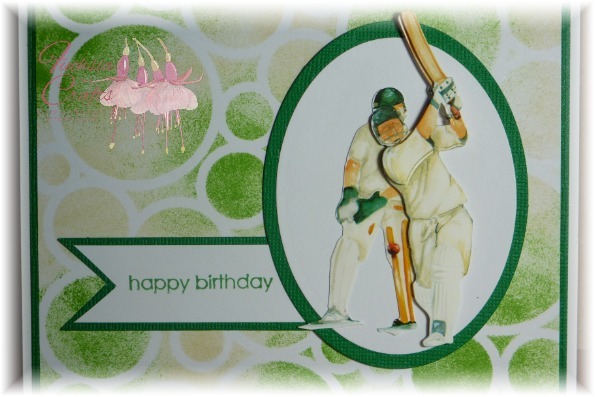 Today is the birthday of one of my cricket-made nephews, so no prizes for guessing what the theme of his cards usually revolves around! 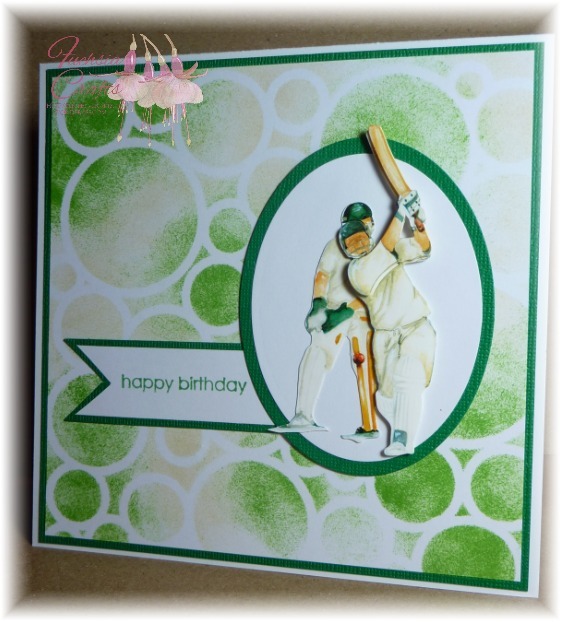 I found this decoupage cricket image in my stash but despite having lots of backing papers, none matched so I made my own. I sponged Antique Linen & Mowed Lawn Distress Inks through a homemade stencil onto plain white paper. 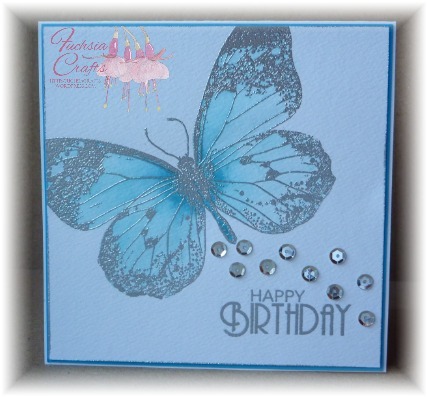 I mounted the image simply onto a Spellbinders oval, and stamped the greeting to finish. I’m entering this into the challenges at Crazy 4 Challenges where the theme is green, & Kraftin’ Kimmie where anything goes this time round. The butterfly stamp is by IndigoBlu and was a recent purchase so this seemed like the ideal opportunity to ink it up. 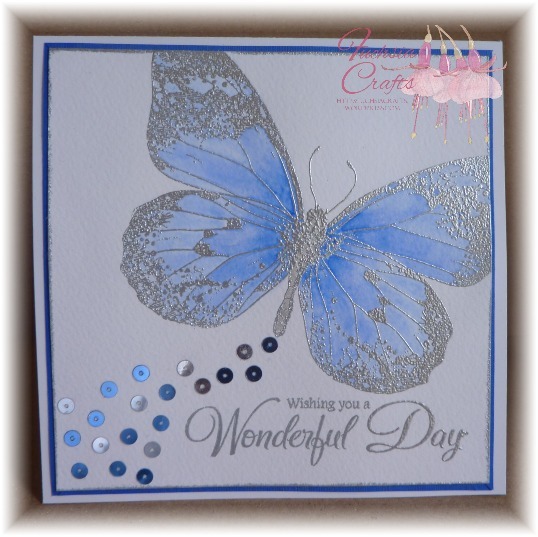 My favourite colouring technique at the moment is watercolouring, so I stamped the butterfly in Versamark ink onto Crafters Companion watercolour paper, then embossed it with Wow! Silver embossing powder. I also inked the edges of the cardstock & embossed that also. A crafty friend and I visited the Sincerely Yours show over at Wrexham yesterday and one of my new purchases was a set of dies by Robert Addams called Techno Gadgets. As soon as I saw it I knew it would be used a lot & I wasn’t wrong! One of my nephews celebrates his birthday this week so it seemed like the ideal opportunity to give it a try. 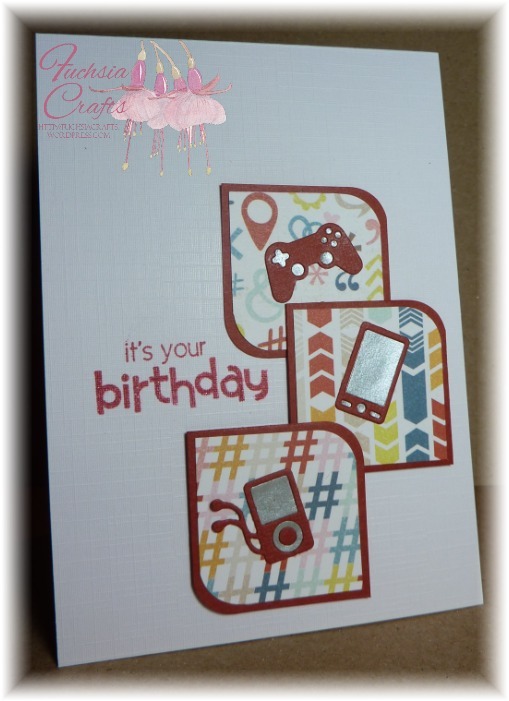 The colour inspiration came from the patterned papers which are from the Cut & Paste range by Jen Allyson for My Mind’s Eye, I thought the symbols matched the gadget theme quite well. The red card is from my stash & I also cut the gadgets in silver paper, too, sticking the tiny buttons etc in place with glue pen. 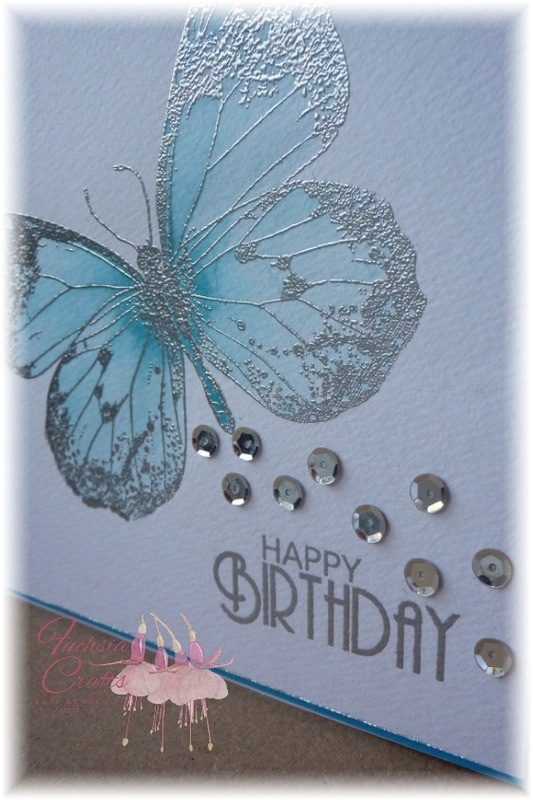 The greeting, stamped in Brilliance Pearlescent Poppy ink, is by Hero Arts. 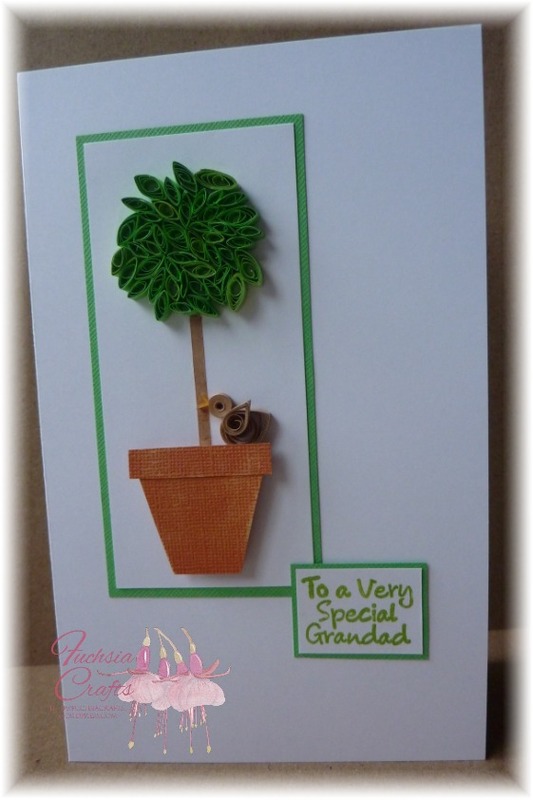 For the second time recently, I seem to have predicted a trend in card making. 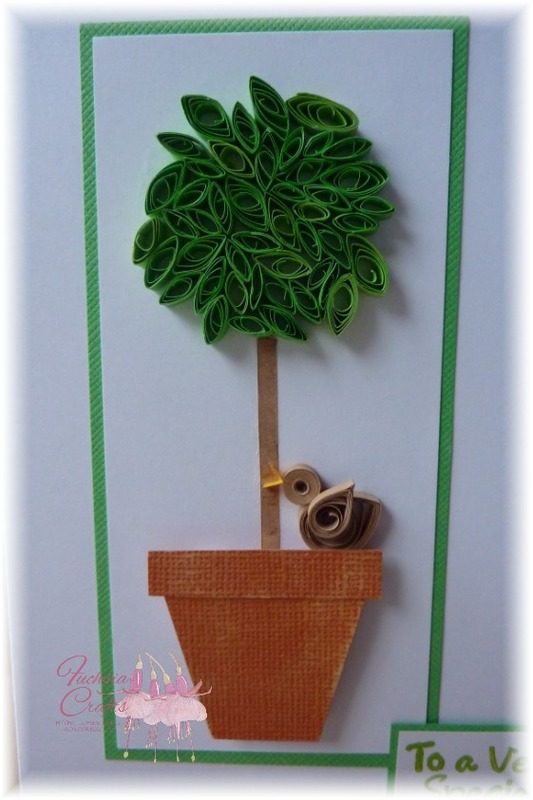 I was tidying my craft area the other week, found my quilling supplies & made this card; the next day I realised that some of the UK craft magazines were offering free quilling gifts! Sorry, no, I still don’t know what next week’s lottery numbers are . 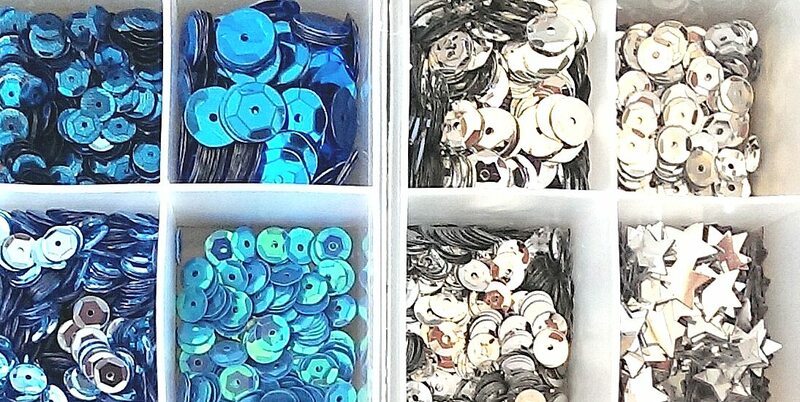 . . . .
I’m entering this into the challenge over at CASology where the theme is Shape – plenty of shapes here! I quilled the leaves in a couple of different shades of green. The pot was simply cut out freehand & distressed using a sanding tool. And as there’s a bird in it, I’m also entering it into the challenge over at Addicted to CAS where the theme is Birds. I must apologise for the following photo, it’s dreadful! And the stamping’s not good either, the stamps are by Fizzy Moon & the quality is quite poor.